Honor and Brogan have been friends with benefits for 17 years. Despite loving him for all of that time he’s never seen her as anything more than passing time. As he describes it, she’s like “an old baseball glove”. With her biological clock ticking away she is desperate for more…marriage, children, forever. 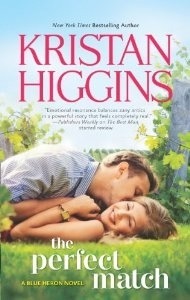 But when she suggests marriage, Brogan laughs it off as messing with a good thing. And then a matter of weeks later he rubs salt in by becoming engaged to her best friend. Tom is an Englishman on a work visa. When the college where he lectures announces they won’t be renewing his tenure his time in the U.S. is suddenly short. But he is desperate to stay in the U.S. and close to the boy he considers his son, so Honor and Tom decide on a marriage of convenience. He will get his green card and be able to stay in the U.S., she will be able to salvage some of the shreds of her pride and hopefully get a child in the bargain. That marriage of convenience plot line generally annoys me. It’s usually a whole bunch of misunderstandings and missteps and honestly it’s always felt like slow torture to me. But, The Perfect Match is actually pretty good. it’s your typical feel good contemporary romance but with likeable characters and a solid story it worked. I did struggle with the “marriage for green card” aspect but everything else was so good that I’m willing to let that slide. This entry was posted in Uncategorized and tagged blue heron, contemporary romance, kristan higgins, the perfect match by setaian. Bookmark the permalink.